Is believing in gods actually harmful? How has Christianity for centuries served as an ideology of conquest and subjugation? Why is the "Bible Belt" in the U.S. also the "lynching belt"? Why is there a rise of religious fundamentalism throughout the world? In the intensifying conflict between U.S. imperialism and Islamic fundamentalism, is the only choice to take one side or the other? Why is patriarchy and the oppression of women foundational to so many religions? Can people be good without god? These are just some of the questions explored in this provocative work by Bob Avakian. "Bob Avakian has written a memoir containing three unique but interwoven stories. The first tells of a white middle-class kid growing up in 50s America who goes to an integrated high school and has his world turned around; the second of a young man who overcomes a near-fatal disease and jumps with both feet into the heady swirl of Berkeley in the 60s; and the third of a radical activist who matures into a tempered revolutionary communist leader. If you think about the past or if you urgently care about the future ... if you want to hear a unique voice of utter realism and deep humanity ... and if you dare to have your assumptions challenged and your stereotypes overturned ... then you won't want to miss this book. "Bob Avakian is a long distance runner in the freedom struggle against imperialism, racism and capitalism. His voice and witness are indispensable in our efforts to enhance the wretched of the earth. And his powerful story of commitment is timely." "A truly interesting account of Bob Avakian's life, a humanizing portrait of someone who is often seen only as a hard-line revolutionary. I can understand why Bob Avakian has drawn so many ardent supporters. He speaks to people's alienation from a warlike and capitalist society, and holds out the possibility for radical change." This collection allow the reader to experience firsthand the freewheeling Bob Avakian in the process of developing his thinking and reenvisioning the communist project on a wide range of controversies, from the dictatorship of the proletariat to discussions of truth, beauty, science and imagination. 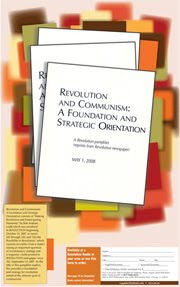 Excerpted from formal talks, as well as, more informal discussions and conversations, this collection allows the reader to experience firsthand the freewheeling Bob Avakian in the process of developing his thinking and reenvisioning the communist project on a wide range of controversies, from the dictatorship of the proletariat to discussions of truth, beauty, science and imagination. This provocative book includes a scathing refutation of the reality behind conservative Christian fundamentalist morality, a critical look at the limitations of "liberation theology," including a discussion of Jim Wallis' book, The Soul of Politics, and an inspiring look at morality from a revolutionary perspective. This work is even more timely today as it was when it was published in 1999. Bob Avakian says in the Prologue that "From whatever vantage point one looks, it is unmistakable that there is what could be called a 'moral crisis' in America. There has been, to a significant degree, 'a breakdown of traditional morality.' But the answer to this – at least the answer that is in the interests of the majority of people in the U.S. and the overwhelming majority of humanity – is not a more aggressive assertion of that 'traditional morality' but winning people to a radically different morality, in the process of radically transforming society and the world as a whole." Bill Martin is a radical professor of philosophy and maverick social theorist. Bob Avakian is a visionary communist thinker and revolutionary leader. They both reject the fashionable claim that the "triumph" of capitalism forecloses the possibility of radical change. These lively conversations between Avakian and Martin probe a range of issues: the place of ethics in politics; the Maoist experience in China; sustainable agriculture and today’s lopsided economic development; the post-9/11 agenda of the U.S. ruling class; Marxism and homosexuality; secularism and religion; and animal rights. A major theme running through this dialogue is the relationship between materialism and ethics. Bob Avakian has written a bold and challenging book that cuts right to the debate of our times. Is capitalism the best of all possible worlds? Avakian contrasts the brutal realities of the free market to the claims of its defenders. Has communism proven to be a disasterous nightmare? Avakian refutes the charges that socialist economies are unworkable and that communism supresses individuality and freedom. But he probes deeper, into the real history and lessons of the revolution, especially the Maoist Cultural Revolution. Can revolutions survive in a hostile world? How can they avoid going sour? And is it really possible to move society beyond private gain and money relations? Bob Avakian shows that communism is both visionary and practical. If you want to know what real communism is about, and if you wonder whether society has to be run as a dog-eat-dog enterprise, then you will find this book as tmely as it is provacative. Second edition includes appendix with the essay, "Democracy: More Than Ever We Can and Must Do Better Than That." This pamphlet emphatically challenges and refutes the message that revolution is impossible and communism unworkable and not desirable. In fact, revolution and communism are exactly what humanity needs! This pamphlet speaks to why communist revolution is not only necessary, but possible -- and how it could be made. It concentrates the strategic foundation and scaffolding for advancing on the road of revolution and communism, and winning growing numbers of the masses to that cause, through hard struggle (both against the enemy, but also including sharp ideological struggle with the masses) and with all the twists and turns that will inevitably be encountered.